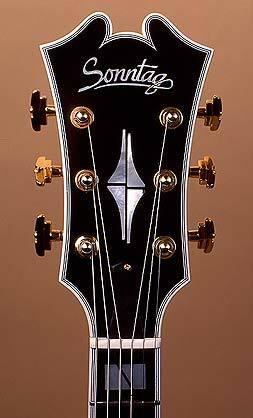 Headstock covers and pickguards can be manufactured in Ebony, Celluloid and plastic. Metal and Ebony tailpieces are available. Wood bindings instead of ABS plastic bindings are available at an extra charge. All guitars can be ordered as a 7-string version at an extra charge. Extra 7th strings can be purchased at my workshop. An Acrylic or Nitrocellulose finish in natural color is included (exception: Allegria only comes in Polyester finish). There is a choice of other colors available at an extra cost. Prices for options can be found in the sidebar or in the price list. These prices include 19% VAT.